For the first time since 1976, there's a new figure skating event at the Olympics. Let's learn about the "Mixed Team" competition before NBC has to condescendingly explain it to you. Why have team skating in the first place? The event, which was announced in 2011, promises to make athletes, organizers, and media partners happy. It's another medal opportunity, a large sop to the skating powers that drive the sport. It's especially crucial to countries like the U.S., which has a relatively deep bench of skating talent but not necessarily a major individual star. Beyond that, it's an opportunity to keep figure skating–and figure skaters–in the public eye as long as possible during the games. The International Olympic Committee says the team event is part of an attempt to help modernize the games, keep the Olympic program "relevant and appealing to younger generations, " and to ensure that it remains "in tune with the latest trends and developments" in the sports world. What that means in English is that figure skating wants to dominate these games from start to finish. Figure skating tends to be a high-profile Olympic sport, and over the years Olympic skating events have regularly been the highest ratings draws, so there's a massive financial incentive to keep skaters on TV. Amid prolonged hand-wringing about the sport's allegedly flagging popularity, adding this new event–though grounded in notions of nationalistic pride and camaraderie–effectively doubles the amount of primetime skating coverage, which usually doesn't start until a week into the games. "When you have other teammates that are sitting there pulling for you, and you know that whether you land the quad triple or do a quad double, it's not a throwaway — it could be other people's gold medal that you're throwing away. In fact, I think they might feel a sense of responsibility that pushes them harder." Ten nations (Canada, Russia, the United States, Japan, Italy, France, China, the Ukraine, Germany, and Great Britain) qualified to compete, based on their skaters' individual performances at a series of recent international competitions. Each team consists of a woman, a man, a pairs team, and an ice dancing team. Each country's skating federation has selected their six athletes from the pool of skaters qualified to compete at Sochi in their individual disciplines. The actual competition, like most skating competitions, is broken down into two parts: the short program and the free skate (which for ice dancers is called the free dance). The short program competition takes place over two days, with skaters from two disciplines competing on each night. On Thursday the men and pairs teams competed, and the ladies and ice dancers will skate today. After each competition, the highest scoring skater from each group gets 10 points, the second-highest gets nine points, the third-highest gets eight, and so on. Once the men, women, pairs, and ice dancers have all skated their short programs, those scores are tallied and the five teams with the lowest total scores are eliminated from the competition. The top five teams move on to the free skate portion, which begins later today. So a country that has a strong shot at winning an individual medal but not the team medal might choose to sit their best athletes. Case in point: Germany's Aliona Savchenko and Robin Szolkowy have a good shot at winning a pairs medal, but Germany is relatively weak in the team event—so Savchenko and Szolkowy are skipping it. Other countries are hedging their bets in different ways. Pairs gold medal favorites Tatiana Volosozhar and Maxim Trankov skated Thursday for Russia, but will reportedly be swapped out for the team event free skate, giving them some time to recover for the individual competition. But 31-year-old Yevgeny Plushenko–the only men's singles skater representing Russia–has no choice but to skate both programs. Countries are not required to disclose their lineups for the free skate until 10 a.m. local time the day before each competition, but Gracie Gold is expected to sub in for Ashley Wagner after the short program, and Jason Brown will likely replace Jeremy Abbott for the free skate. Japan's Mao Asada, on the other hand, is expected to skate the short program but not the free skate. Still, a lot of these decisions aren't official–and likely won't be until the last minute. The rules governing the team selection process reflect an eagerness to shroud the decisions in secrecy, allowing for possibly dramatic last-minute changes to the lineup. And, subsequently, good television. Going into the start of the competition, the top medal favorites were widely perceived as Canada, Russia, the U.S., and Japan, though each country has a perceived hole in its lineup. But after a particularly weak performance by Jeremy Abbott, the U.S. sits in a disappointing seventh place. (The U.S. team actually has the same number of points as Germany and France, but due to tiebreaking procedures sit on the outside looking in.) Russia is currently in first, followed by Canada, China, and Japan. But the current standings are hardly set in stone. The U.S. has the top-ranked ice dancing team and a strong team of ladies, but the pairs team of Marissa Castelli and Simon Shnapir are considered the weak link. Meanwhile, the Russian and Japanese teams have relatively weak ice dancers, while the Canadians are weakest in the ladies event. Barring catastrophe, the U.S. shouldn't have too much trouble overtaking Germany and France in ladies/ice dancing portion of the free skate. Still, things are looking pretty good for Russia and Canada. 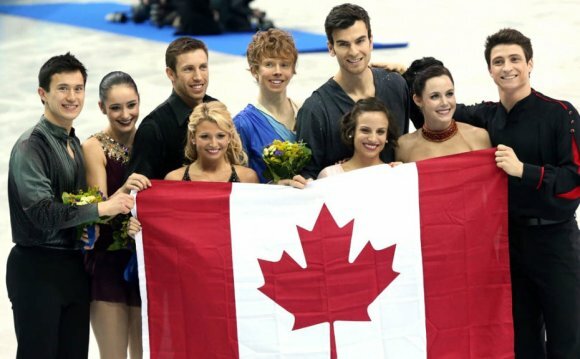 Russia boasts powerhouses in Plushenko, Julia Lipnitskaia, and the pairs team of Volosozhar and Trankov; Canada has a strong team in Patrick Chan, ice dancers Tessa Virtue and Scott Moir, and pairs skaters Meagan Duhamel and Eric Radford. They're even kicking it old school by coming up with a mixtape. Marissa Castelli says it's not a playlist; it's an actual CD with tracks, like "How Far We've Come" by Matchbox 20, and a lot of pump-up music and rap music.